I'm linking up with the Modern Mrs Darcy for some reading inspiration. Summer is a huge fiction reading time for me. The kids are out of school and we dive straight into the summer reading program. Fiction fits my life right now between trips to the pool, rainy afternoons, and vacations. I plan on switching gears a bit mid july to some more non-fiction reads. I have a stack of business and life books I need to tackle before the fall hits, but for now I will enjoy some great fiction books. On to my book report! A story about a couple who mysteriousy vanished from their home 70+ years ago leaving behind an infant daughter on Scribbly Gum Island. Years later the Munro Baby Mystery is still a famous money making business. Sophie Honeywell finds herself in the middle of this famous family's secrets when she inherits a home on the island. It was a good book but not my favorite of Liane Moriarty. I found the story a bit predictable and dragging at some points. If you are new to her books, start with Big Little Lies. The Brilliant Business Mom's podcast has become one of my favorite new podcasts of 2015. So I was super excited when they annouced a book and planner product. I got both!!! Much like their podcast, this book is organized, practical, full of personal stories, and well thought out. I work at home and have kids at home so I found this book to be EXACTLY what I needed in this season. It comes with links to FUN pritancles to work through while you read and while you are at it - BUY their planner. It is fabulous. The Ship of Brides is about the war brides of World War II. It follows the story of four war brides who make the long journey from Australia to England to be reunited with the husbands they wed during the war. They journey to England on a navy ship with other officers for six weeks. It is sad and redemptive. 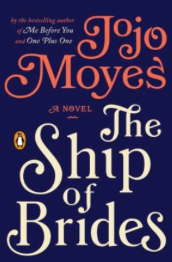 Again, not my favorite Jojo moyes book. It was a slow start for me but I really enjoyed the ending. If you are new to Jojo Moyes books, I recommend starting with The Girl you left Behind. I am going to read my second Chris Pavone book. I have been waiting for MONTHS for this book to finally make its way to my library. Starting it today! Brad read this book in May and LOVED it. He has been patiently waiting for me to read it too. Speaking of Brad, he got a pre-released copy of this is the spring. I've been meaning to read it. And my fourth grader and I are reading through this book for his summer reading program. So cute! We love it.